In many ways this is a classic, hard SF militaristic space novel. Some part of humanity is holed up on a rocky planet, surrounded by the remains of what may have been a Dyson sphere, under regular attack from aliens known as the Krell. (Forbidden Planet, anyone?) A brave bunch of starfighter pilots regularly launch to defend humanity from alien ships, some of which huge bombs that could mean the end of their civilisation if one gets through. And, in this setting, our central character, Spensa Nightshade, undergoes her training as a cadet starfighter pilot. She's the daughter of a disgraced pilot, once hero of the fleet, who apparently abandoned his comrades and had to be shot down as a coward. As a result she's an underdog and constantly in danger of being expelled from the ranks. There are plenty of traditional elements in there, with the exception of the protagonist being female (as I've commented before, this is the new norm in SF adventure titles). 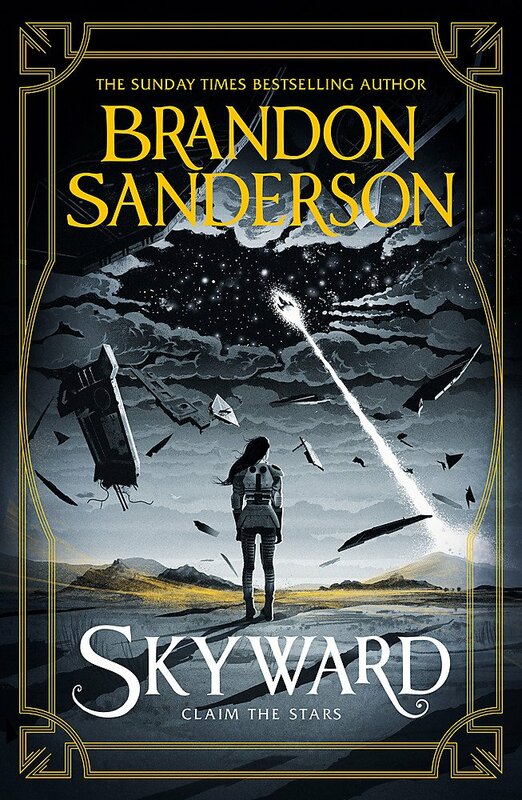 However, Sanderson throws in enough detail and complexity to make the storyline genuinely engaging. There are a couple of unexpected twists and the equivalent of Jedis/the Force in Star Wars provided by a mysterious wrecked ship with super technology and a mystical human ability. Oh and there's a strange alien slug-like creature that can parrot language, which surely is going to be given more to do in a sequel. 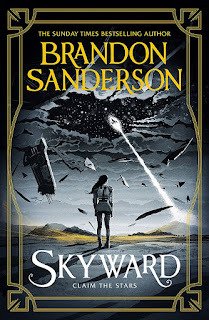 Provided, as an adult reader, you are prepared to accept a certain element of juvenilia (I was reminded of Heinlein's Starman Jones from my youth) Skyward draws the reader in and provides continuous page-turning action. Sanderson is also effective in not sparing all the central characters, losing some along the way to battle, personality or politics. The final few chapters particularly were pure unputdownable pleasure. My small provisos were first that the book is too long - J. K. Rowling's books were so much better before she developed uncontrolled bloat, but if the first title in this trilogy is 510 pages, how long will later ones be? And I hated the illustrations, which show the spaceships and their capabilities: they looked just like the pseudo 'technical specs' part of a computer game, which made me feel like I was being set up to buy the game of the book. But that's a minor moan. I confess, I'm hooked. I'll be waiting for the next volume with considerably more interest than I was with the exploits of Mr Potter.